I woke up this morning to drops hitting the window. The window was open and it smelled of rain, it was chilly and dark. I knew it was the perfect day for slow cooking and comfort food. I laid in bed, cuddling the cat and thought to myself, what’s the perfect dish to make on a day like today? Then it hit me! Moist, flavourful meatballs in a rich tomato sauce. But since I wanted these to be extra special, I thought why not throw some cheese on top and bake them until they turn into a gooey, cheesy, tasteful delight? Fair warning – these are not healthy. But they will guaranteed be one of the best things you’ve ever put in your mouth. I realise this is a big claim, but I stand by it and I dare you to disagree. I woke up Evan and dragged him to the store to pick up the ingredients I was missing. He was a little upset to be woke up at first but then when he tasted the sauce sometime later, he smiled and said it was totally worth it! This sauce is a bit unusual because it actually bakes in the oven. This is for 2 reasons: one you don’t have stir nearly as frequently (which is a big bonus in my eyes) and two, and most importantly, the tomatoes caramelise and get rich and dark and delicious. 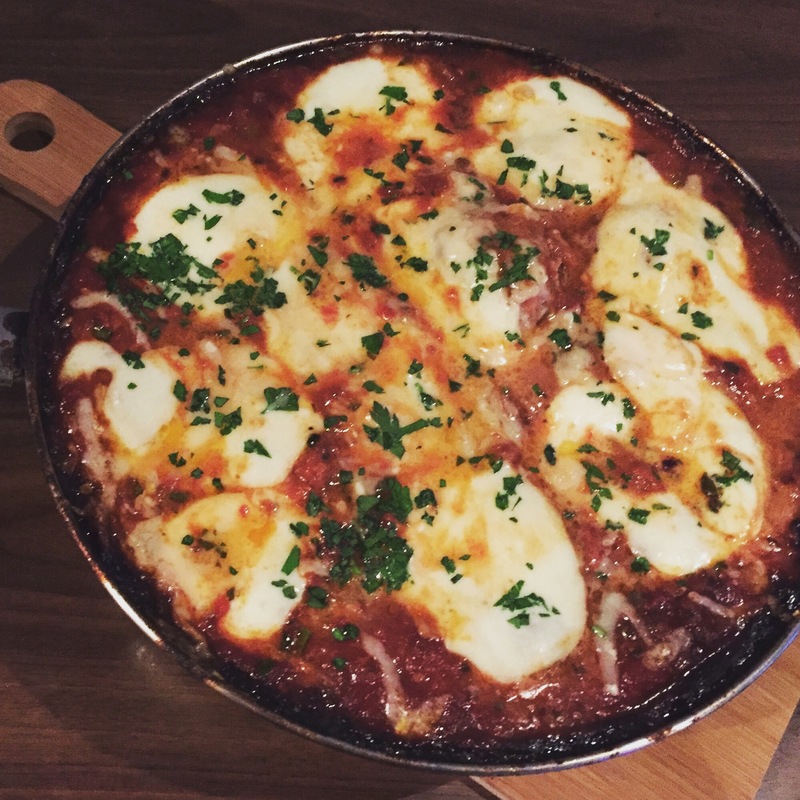 I’m sure Italian Nonnas are rolling in their graves at my butchery of classic Italian sauces, but while this may not be a traditional recipe, it tastes damn delicious and really what more could you want than that! So let’s start on the sauce and we’ll talk about the meatballs (the best you’ll ever have) in a bit. As you can see above, there aren’t too many ingredients needed for this delicious sauce (missing in the photo: dried oregano and a knob of butter). First pre-heat the oven to 300º F. Get a deep, ovenproof pan heating over medium high heat. Add some olive oil and a knob of butter and heat gently. In the meantime grate 1 onion and finely mince about 8 cloves of garlic (vampires beware). If you’re looking at the above picture and think that the garlic looks a bit weird, you’d be right. I actually used a smoked garlic that we bought from a food festival, but this is by no means necessary, regular ol’ garlic will do the trick (if you can find the smoked stuff, please try it! It’s amazing!). Anyways, where were we? Right, add the grated onion and minced garlic to the pan. Then toss in your dried oregano. Fry everything until it’s softened and fragrant. You’re not looking to develop any colour at this point. Once the onion, garlic and oregano are softened and your house is starting to smell a little like Italy, then toss in some finely chopped olives and red pepper flakes. A note about adding the olives – I get that many of you poor, poor souls dislike them, a fact that boggles my mind, but have no fear – you can’t actually taste them in this sauce. You’re adding them for their saltiness and umami inducing properties. Trust me and throw them in, I promise you won’t know they’re there. (if your disdain for them is so great that you consider them to be little balls from hell, then by all means leave them out). While your olive, onion mixture is slowly cooking, throw your whole, peeled tomatoes into a large bowl, juice and all. Then get your hands in there and scrunch them up, crushing them until the pieces are about 2 cm in size. The reason I use whole tomatoes instead of the already chopped ones is because they tend to taste better and I like choosing how big or small I want the pieces. If you only have the already chopped kind on hand fret not, use those instead. Toss your tomatoes into the onion, olive mixture and give it a good stir. Then throw in the stalks of the basil and parsley, 1 carrot sliced into thick chunks and another onion, peeled and halved. The carrot and onion will give the finished sauce a hint of sweetness. At this point add in about half a cup of wine and 2 Tbsp of balsamic vinegar. Bring the sauce to a simmer. Once simmering, carefully put the sauce in the oven and let it bake. Stir it every hour or so. You’ll notice that the top gets nice and caramelised. Continue to bake for about 4 hours until the sauce has reduced by one third. This brings us to the meatballs portion of this post. Now before we go on, I have to tell you that I feel quite strongly about meatballs. We’ve all had the so dry you need a sip of water with every bite ball, or the tasteless, heavy, gloupy kind. These meatballs are moist and juicy and well huge too (*wink, wink). 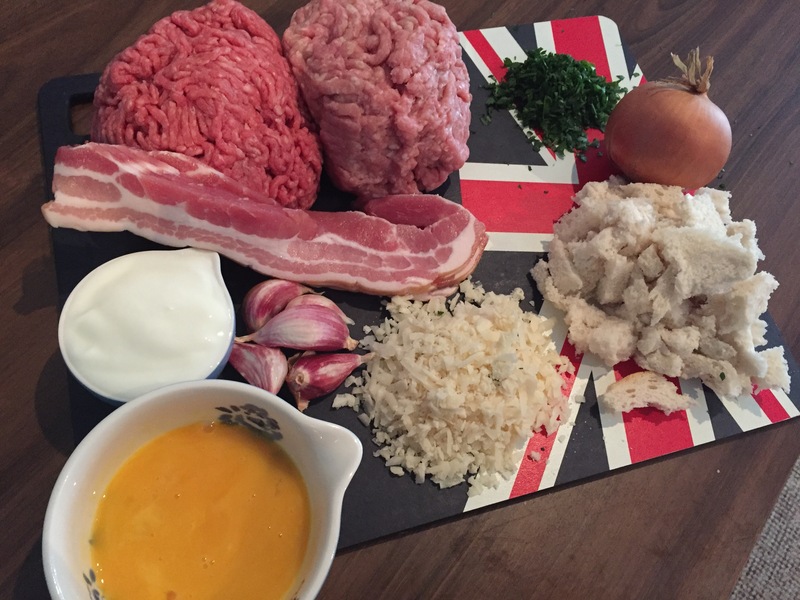 These meatballs are a combination of lean ground beef and ground pork and there’s bacon thrown in not just for the smokiness factor (for my UK friends, please always buy smoked bacon thank you very much) but also the fattiness of the bacon helps to keep them so moist. But I’m getting ahead of myself, the first step is to grab some white bread, remove the crusts and tear into little pieces, then cover with some buttermilk. If you don’t have any buttermilk on hand make your own by combining half a cup of milk with a tablespoon of lemon juice and letting it sit for 5 minutes. 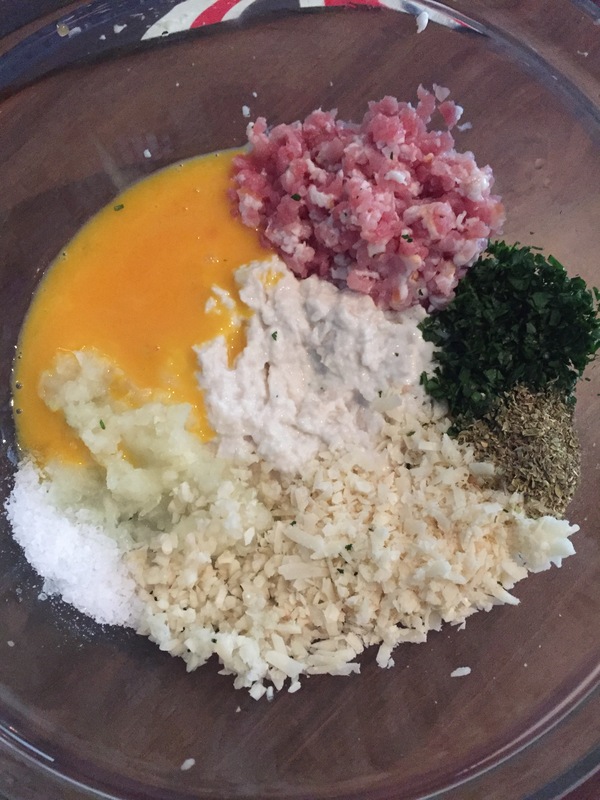 Add the paste to a large bowl and throw in some Parmesan, salt, pepper, oregano, parsley, grated onion, minced garlic and the finely chopped bacon. Give everything a good stir, you want to make sure that everything is thoroughly mixed. Then add your meats. Now it’s time to get your hands dirty. You want to knead the meat and bread mixture until thoroughly combined and you get an almost whipped texture. If you have a stand mixer, it’s a good idea to use it here. Once everything is combined, shape the mixture into balls. I made giant ones because I didn’t want to spend all my time frying them and again I didn’t want to lose any moisture. Once you have nice, round balls, melt a knob of butter into some olive oil and gently fry the meatballs until starting to brown on all sides. I find turning them with two wooden spoons the easiest way to maintain their shape. Great, now remember the sauce that you’ve been baking in the oven? Take it out, toss in some herbs and add your meatballs. And that’s it! Serve it over pasta or tortellini or ravioli, or simply scoop a meatball out and eat with some crusty garlic bread. You won’t believe the flavours. In a large bowl add tomatoes and crush between fingers, set aside. Meanwhile, heat a large ovenproof pan over medium high heat, add the oil and butter. Once the butter is melted, add the grated onion, garlic and oregano. Cook until softened. Add the chilli flakes, salt and pepper. Add the tomatoes and bring to a simmer. Add the remaining ingredients and simmer for 5 minutes, then carefully transfer to pre-heated oven. Bake for approximately 4 hours until the sauce has reduced by a third and it’s a deep, caramelised red colour. Stir once in a while. While the sauce is cooking, prepare your meatballs. In a bowl combine the bread and buttermilk. Let it sit for 10 minutes, then scrunch up the mixture against the edge of the bowl turning it into a paste. 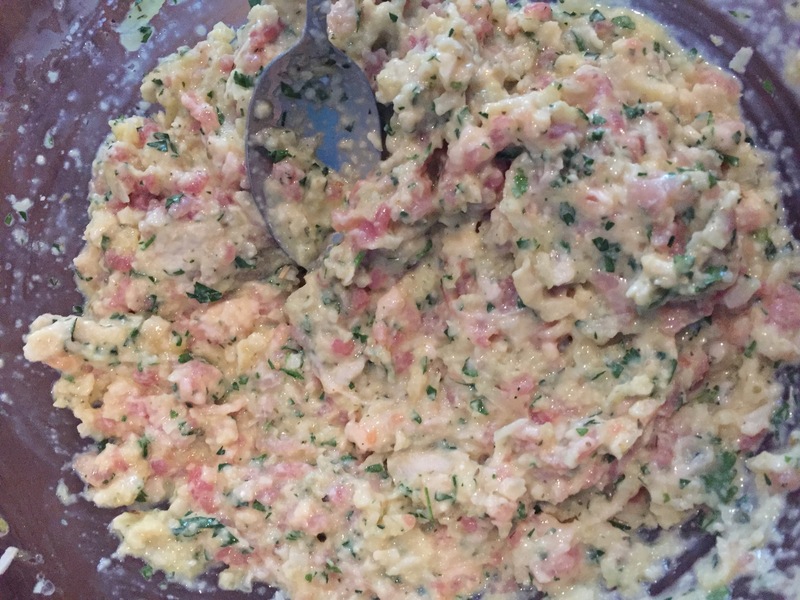 In a large bowl mix the bread mixture, onion, parmesan, salt, pepper, oregano, egg yolks, parsley and finely chopped bacon. Mix very well. Add the meats and knead with your hands until the mixture is very well incorporated and looks almost whipped. Shape meatballs, and fry in some olive oil and butter until lightly brown on all sides. 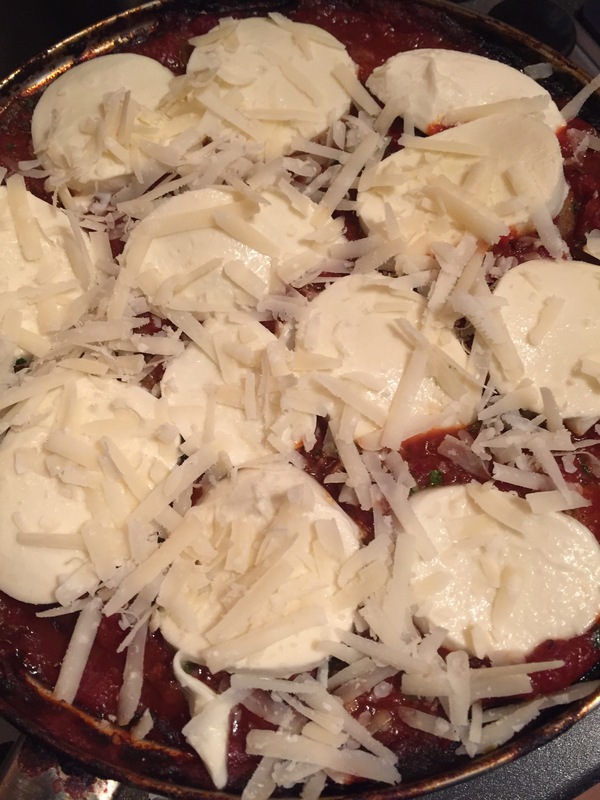 Add to the sauce and bake for 20 minutes, cover with fresh mozzarella and parmesan and broil for 5 minutes. Serve over pasta or with crusty bread. Enjoy! Buttermilk bread in the balls?! Game changer.